​By building MDM domains on top of your data lake utilizing a performance-optimized semantic layer, each mastered domain integrates quickly and easily within the existing ecosystem of operational and analytical systems without requiring expensive rework. 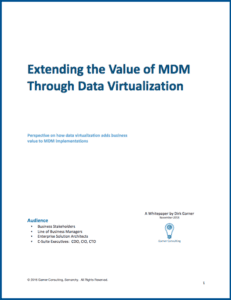 This whitepaper will outline the path to delivering business value quickly by using agile MDM powered by your data lake and a performance-optimized semantic layer. Increasingly, businesses have seen that having a mobile presence is a core element to remaining relevant and competitive, and most organizations have established a mobile presence in one way or another. Many enterprises’ initial attempts at mobile presence have fallen short of both business and customer expectations, and have failed to deliver the planned business value or help achieve digital business goals. This research paper demonstrates how using Kinvey can allow a company to launch their Minimum Viable Product (MVP) app in record time and with high levels of user adoption and app ratings - an average of 4.8 stars across all companies interviewed. "Faster Analytics Results: Shorten your Data Supply Chain"
​Accurate, timely, and whole information assets are critical to success in this fast-moving business climate. By the time complicated IT Projects deliver this information capability it is likely to be out of date. The combination of two complimentary agile technologies, data virtualization and agile Master Data Management, when paired together, can provide a new approach to getting all relevant information in the right place at the right time. This paper provides an overview of both of these empowering technologies and how they can work together to solve complicated enterprise data integration and quality issues. 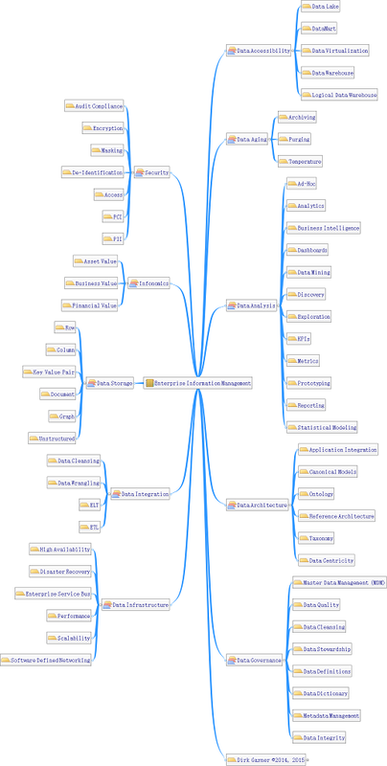 "App Ubiquity Drives Engagement and Loyalty"
"Get There Faster: Evolving Shadow IT into Collaborative IT"
"Evolved Data Warehousing: A Hybrid Data Warehouse Overview"
"Accelerating Insights: Agile BI through Rapid Prototyping"
What does an evolved data warehouse look like? Can we handle multiple data types and growing data volume and still deliver high performance? How can we load and integrate data quickly while optimizing for data mining, analytics, and visualizations? 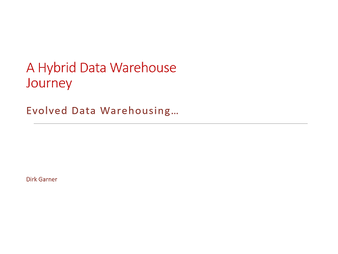 This presentation will address these questions and more with focus on a typical journey from a classic row based OLTP Data Warehouse of yesteryear to a hybrid data warehouse including strategies such as: columnar stores, unstructured data, data virtualization, logical data warehouse, graph, streaming, and more. 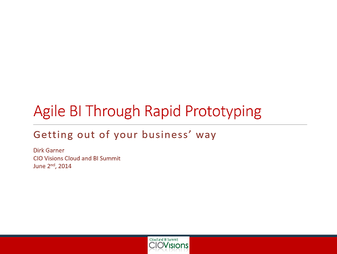 Inaccessible or non-integrated data can derail, postpone or cancel BI & analytical efforts. This encourages siloed one-off work-around tactics leading to ungoverned use of data causing inaccuracies, inconsistencies, and incompleteness. 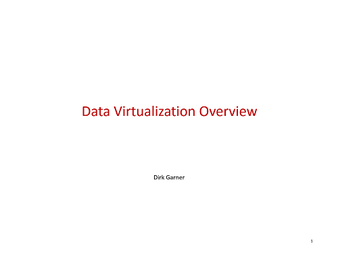 This presentation addresses how Data Virtualization provides immediate & performant access to diverse data sets to enable faster time-to-market and more focused utilization of data scientists and analysts. 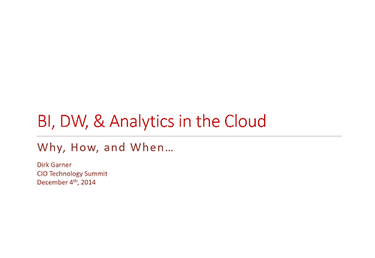 BI, Data Warehouse, & Analytics in the Cloud: Why, How, & When? 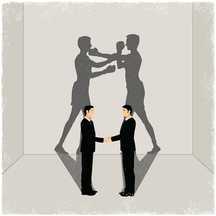 Is cloud really a security risk? Is the cloud slower than on premises? 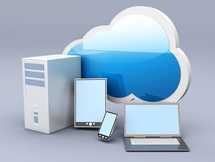 What is driving businesses to the cloud for their BI efforts? 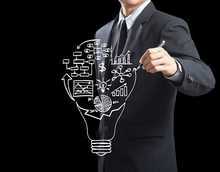 What are the expected advantages? This presentation addresses these questions and more including some rather compelling reasons to move your BI efforts to the cloud while also tackling Data Virtualization. Topics include: operational benefits, cost advantages, staffing considerations, green initiatives, improved agility, and competitive advantage. "Data Strategy Shorts" is our video blog series providing snippets of data strategy tips.